As much fun as they are, your average Halloween party tends to follow the exact same routine. You watch some horror movies, wear costumes and eat a lot of candy and Halloween-themed foods. There might be some games and the telling of ghost stories, or perhaps even a trip through a homemade haunted house in the basement or garage. Now if you really want to set your next Halloween gathering apart from the rest, you should invest some time and effort into learning some season-appropriate magic tricks. The results will be well worth it. I personally recommend practicing in front of a mirror. Just be warned that the following links contain spoilers for several great magic tricks, so those who prefer to watch rather than perform should probably read another article. RavensBlight.com has both instructions for “The Psychic Energy Trick,” “The Business Card Trick” and “The Human Levitation Trick” (and creepy printouts to go with them). Similarly, eHow.com offers up several sets of instructions for scary magic tricks. The Complete Idiot’s Guide to Magic Tricks by Tom Ogden has a wonderfully creepy mentalism routine called “Living or Dead?” that is both easy to learn and incredibly effective. That said, you should be completely sure there have been no recent deaths in your guests’ families before attempting this one. 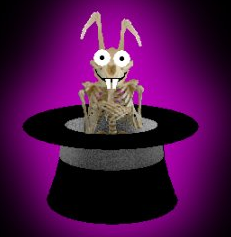 Fans of card tricks are sure to appreciate this amazing (and spooky) trick from Gimmicks and Card Tricks: Illusions for the Intermediate Magician by Paul Zenon. If you don’t know what “crimping” is, then this should be of great use to you. To up the fear factor, I suggest using a more paranormal (false) explanation for the trick rather than the one Mr. Zenon uses. The Google Books preview for Spine-Tingling Magic Tricks (originally published as “Spooky Magic Tricks“) by David Knoles has several tutorials, like “A Spooky Knot,” “The Spirited Handkerchief,” “The Phantom Tube” and “The Floating Ghost.” Don’t let the names of the first two tricks fool you, as they’re much more impressive than you’d think. In fact, Blackstone the Magician’s most famous trick was the haunted handkerchief! I should also note that, while the tutorial for the last trick is incomplete in this preview, reading this should help you piece together how it’s done. Purchasing the book is highly recommended, as it has lots of other great tricks that aren’t available on Google Books.